Although Ted Ginn, Jr. is in his ninth NFL season, his wheels don’t seem to be slowing down. Ginn had 102 total yards on offense during the Panthers' Week 7 win against the Eagles, including an end-around play in which he reached a top speed of 21.93 mph to dust the defense. That was the second-fastest foot speed of any ball carrier in week 7. Make no mistake about it — Ginn’s supersonic speed is a result of his intense training. He hones his athleticism with drills like Explosive Starts and Build-Ups. The goal of NFL offensive linemen, for the most part, is to not draw attention to themselves through their play. The object is to be a wall or, more precisely, to be a cinderblock in a wall that doesn’t allow pressure on quarterbacks or hits on ball carriers. As a rookie NFL lineman cast in an unfamiliar role, Redskins right guard Brandon Scherff has done well at just that, establishing himself as a reliable contributor toward a 3-4 record that’s solid enough to keep Washington relevant in this season’s undistinguished NFC East. Q: What do you like to fish for? Q: When did you first go hunting? Q: What did you hunt with? Verbs are a rarity in interviews with Scherff. He uses adjectives even more sparingly. But this man of few words has emerged as an NFL lineman of few mistakes — despite switching from left tackle at Iowa to right tackle after the Redskins chose him with the fifth overall pick in this year’s draft before being converted to right guard during training camp. In his Week 1 debut, the 6-foot-5, 319-pound Scherff kept Miami’s Ndamukong Suh in check, limiting the league’s most handsomely compensated defensive tackle to two tackles and no quarterback pressures. After the Week 2 victory over St. Louis, which boasted an equally imposing defensive front, Rams Coach Jeff Fisher compared Scherff and his linemates to the staunch Cowboys lines schooled by Bill Callahan, whom the Redskins hired as their offensive line coach in the off-season. Though the Redskins’ rushing attack has dropped off sharply the past three games, now just 21st in the NFL (99 yards per game), right guard is one less roster spot for Coach Jay Gruden to worry about as he assesses what needs improving in the nine games that follow the bye week. Scherff’s said his plan for the five-day break included plenty of rest, some film study and a trip home to Iowa for deer hunting. Seven games into the season, Scherff and Moses are the only two linemen among the five opening-day starters to have not missed a game because of injury. Left guard Shawn Lauvao suffered a season-ending ankle injury. Left tackle Trent Williams missed one game because of a concussion. And center Kory Lichtensteiger has been sidelined by a disc injury that’s affecting his strength on his left side. As a result, Scherff was second-most experienced starter on the Redskins offensive line for a stretch. Moreover, among the top 10 selections in the 2015 NFL draft, Scherff and Falcons outside linebacker Vic Beasley (chosen eighth overall) are alone in starting all seven games. 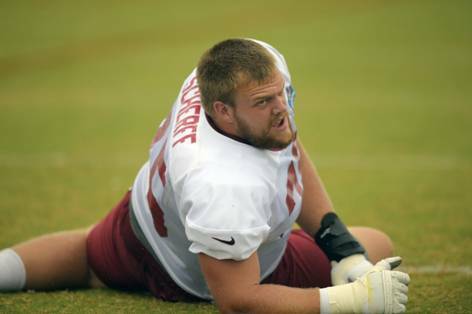 As a lineman, Scherff hasn’t found the spotlight the way NFL “skill players” do. Early conversations about NFL rookie of the year candidates have tended to highlight Raiders wide receiver Amari Cooper (fourth overall), who has drawn comparisons to Odell Beckham Jr. And though his debut was delayed by a lingering injury, Rams running back Todd Gurley could mount a late charge, exploding in his three starts to date, including rushing for more than 100 yards and the game-winning score in the fourth quarter against Arizona. Several pundits faulted the Redskins for spending a fifth-round pick on Scherff, whom most projected as an interior lineman, arguing that only left tackles justify such an investment. But steadiness is Scherff’s game. And like Chris Samuels and Jon Jansen before him, his true value as a Redskin might not be clear until he has played six, seven, eight or more years on the line. Of course, Brandon Scherff refuses to make too much of the matchup. He’s not the excitable type. If you filled his locker with spiders, he’d probably remain stone-faced, survey the problem and quietly figure out a solution. Later, he would get his payback in the same calm manner. And you’d feel the retribution, for sure. And you’d never bother him again. 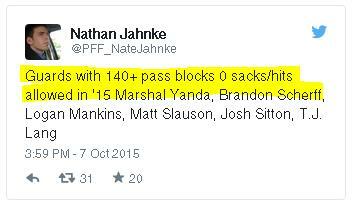 That’s just Scherff, a modest mauler. The rookie right guard will never be described as fun. And theWashington Redskins don’t need him to be fun, just as a patient doesn’t need a surgeon to be fun. He used the phrase “each and every game” five times during an interview Thursday afternoon. He’s a rinse-and-repeat guy, a player who will be appreciated for dependability more than flashes of brilliance. So it’s typical and reassuring that Scherff will approach Sunday’s demanding task with an unconcerned air. The No. 5 pick in April’s NFL draft will face the player Washington bypassed to select him, New York Jets defensive tackle Leonard Williams. And if the possibility of being matched up with the No. 6 pick — and more universally appreciated rookie — weren’t challenging enough, Scherff also gets to lead an offensive line that will be without three starters. And he’ll be leading the unit against a deep and talented Jets defensive front that welcomes the return of Pro Bowl end Sheldon Richardson from a four-game suspension. Is Scherff worried? Fired up? Normal blood pressure should be labeled “SCHERFF” on medical charts. 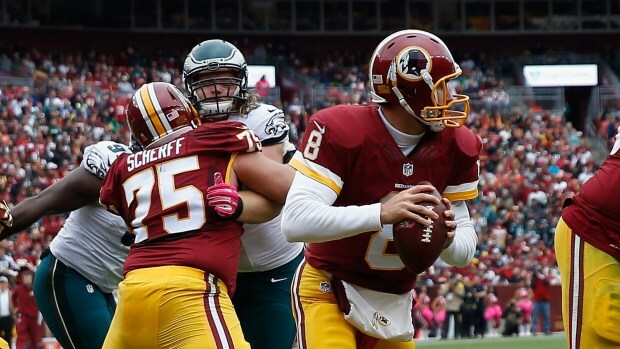 Over the first five games of his NFL career, Scherff has earned the trust of his teammates. The Washington offensive line has been a pleasant surprise so far, reducing sacks dramatically and paving the way for a run game that has had a few dominant performances. But left guard Shawn Lauvao, the team’s best interior run blocker, suffered a season-ending ankle injury three weeks ago. Now, left tackle Trent Williams and center Kory Lichtensteiger will miss the Jets game because of injuries. Scherff and right tackle Morgan Moses, who have a combined 11 NFL starts, suddenly lead a makeshift O-line in seniority. And for all the talented defensive lines Washington has already played, the Jets might have the most star power. “We have a level of concern against that line with the starting lineup,” Coach Jay Gruden said. The Redskins played well last week in Atlanta despite being overmatched, but the injuries might be too great to overcome this time, especially with the Jets coming off a bye week. But if they are competitive at MetLife Stadium, Scherff figures to play a key role in keeping the offensive line functional. It’s the first time he will have such a burden. The flip side is that an offensive guard can only do so much. Which brings us back to debating the value of selecting Scherff so high. General Manager Scot McCloughan made a statement about his intent to transform Washington into a blue-collar team when he drafted Scherff. He didn’t take Williams, who was considered the best player in the draft by several draft analysts. He didn’t take a freakish athlete like pass rusher Vic Beasley, whom Atlanta selected No. 8 overall. McCloughan wanted Scherff, and when he couldn’t find the right partner to trade down and collect more assets before snagging the offensive lineman, he just took Scherff at No. 5, higher than most would have. At the time, the thought was that Scherff would be a right tackle. In training camp, Bill Callahan, the team’s new offensive line guru, moved him to guard. It makes McCloughan’s selection seem even more unorthodox now, but the general manager was most interested in drafting the right player for this situation, not winning over high-brow analysts who think about the selection in a vacuum. Since the draft, McCloughan hasn’t dodged the questions about whether he made the proper decision. He acknowledges that better athletes and sexier picks from this draft class might become stars earlier than Scherff. But for McCloughan, Scherff embodies the four traits he wants to infuse in this roster: competitive, consistent, tough and smart. Scherff is quiet in the locker room, but his presence, work habits and rapid growth have been noticed. “He’s growing fast,” defensive lineman Ricky Jean Francois said. “He’s developing quick. He’s working on his craft. He’s becoming a lot better. He had to grow up real fast because, with this schedule, week in and week out, he’s gone against some of the best defensive linemen. Scherff has been more than just a symbol. He’s already a solid NFL starter with ample room to grow. The coaches rave about how he rarely repeats mistakes. He has the routine and work habits of a veteran. And he’s one of the reasons that the Redskins are a more physical team. To justify being the No. 5 pick, Scherff will need to become one of the NFL’s elite guards. He has to rise to the level of Baltimore’s Marshal Yanda, Dallas’s Zack Martin and Green Bay’s Josh Sitton and stay on that top shelf for the better part of a decade. There’s a difference, however, between justifying the pick to the national audience and satisfying McCloughan’s vision. 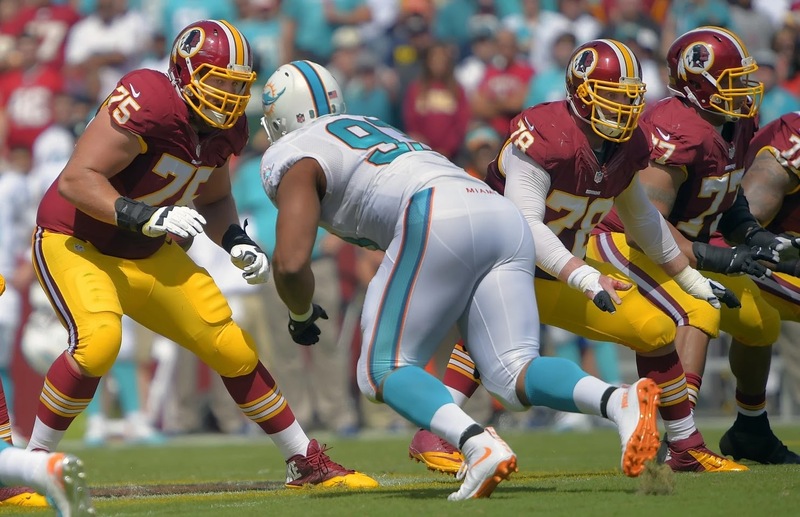 If Scherff is a nice player who joins Williams as a mainstay and becomes something of a Pied Piper for O-line excellence in Washington, McCloughan will look back without regret and consider Scherff the safe pick he envisioned. As the NFL continues to change and feature big interior defensive linemen with extraordinary athletic gifts, the value of quality guard play increases. Guards are no longer just the tough guys you can find anywhere to complement the center and bookend tackles. Interior defensive pressure — a pass rush right in the quarterback’s face — can destroy an offense. And with every defense emphasizing speed, it’s increasingly difficult to run the ball without guards who are both rugged and agile. “Dude, this game is evolving,” Jean Francois said. “This game ain’t the same. I understand why people ask about using a high pick at guard. That approach won’t inspire much buzz, unless we’re talking about the buzz function on an alarm clock. But there’s something appealing about the rare understated No. 5 pick. There’s almost no chance Scherff will be a transcendent, face-of-the-franchise star. That’s not his aspiration. He just wants to be a really good football player. Each and every game. As a piece of McCloughan’s foundation, Scherff is far from flimsy. OWINGS MILLS, Md. 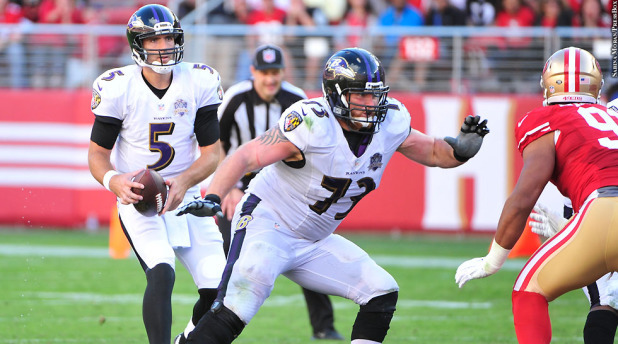 — Four-time Pro Bowl guard Marshal Yanda has signed a four-year extension with the Baltimore Ravens. The 31-year-old Yanda was in the final season of a contract he signed in 2011. 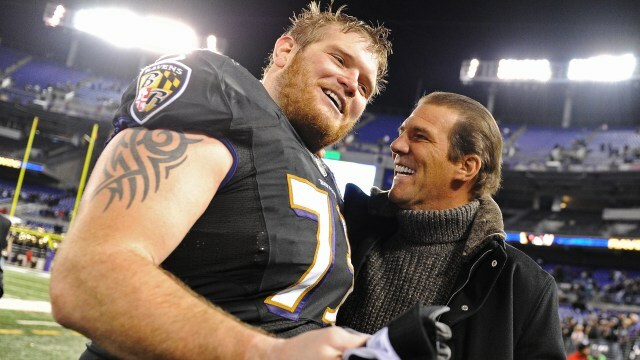 Yanda was a third-round pick out of Iowa by the Ravens in 2007. He started on Baltimore’s 2012 Super Bowl champion team. He has played in 120 games, including 109 starts, over nine NFL seasons. Only two offensive linemen — Hall of Fame left tackle Jonathan Ogden and center Mike Flynn — have played more games with the Ravens. The deal was announced Friday. 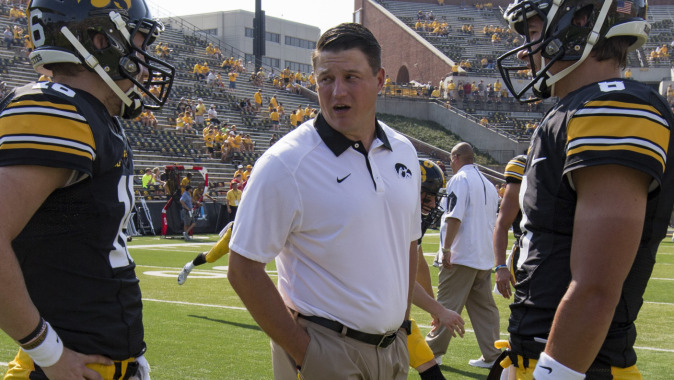 IOWA CITY, Iowa -- University of Iowa assistant football coach Brian Ferentz was named CoachingSearch.com Offensive Line Coach of the Week following Iowa's 29-20 homecoming win against Illinois on Oct. 10. The Hawkeye rushed for 278 yards against the Illini, averaging 5.5 yards per carry and chewing up nearly seven minutes on a fourth quarter drive that included 11 consecutive rushes for 59 yards. The offensive line played without its starting left tackle, finished the game without its starting right tackle, yet still paved the way for running back Jordan Canzeri to rush for 256 yards on a school-record 43 attempts. The complete list of Week 6 coaching honors is available at coachingsearch.com. 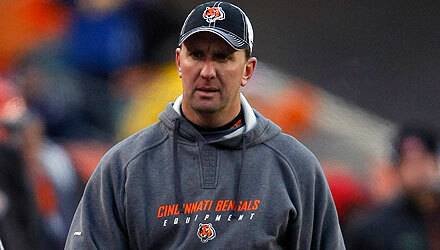 Darrin Simmons, special teams coordinator, Cincinnati. In his 13th year with the Bengals, Sunday was one of Simmons’ finest hours. His kickoff team stuck the Seahawks at the 20, 19, 20, 20 and 20-yard line (obviously a tribute to Mike Nugent’s leg); his punt team pinned Seattle at the 2-yard line twice, and once at the 16. His punt returners, Adam Jones and Brandon Tate, bounced through Seattle for 93 return yards. The Bengals needed everything to go right against the Seahawks to have a good chance to win, and that included special teams. And everything did go right. WASHINGTON — Taken amid fanfare and controversy with the No. 5 overall pick in the draft, Washington Redskins lineman Brandon Scherff had his share of fans and dissenters throughout the offseason and preseason. First he was the right pick–then maybe he wasn’t. He was going to play right tackle–but maybe he would start at right guard. He dealt with injuries. He was part of the preseason Detroit debacle. After making the squad and being named a starter, he had a brutal match-up in his first NFL regular season game, dealing with a Dolphins defensive line that features Cameron Wake and Ndamukong Suh. He was supposed to fail. But he didn’t. Even in a losing effort, Scherff played like a veteran, opening up holes in the running game (37 rushes, 161 yards) and keeping quarterback Kirk Cousins clean. After the game, he earned his head coach’s praise. He had another tough assignment against Rams defensive tackle Aaron Donald in Week 2, but protected the pocket when the two matched up. In Week 3, it was Giants veteran defensive tackle Cullen Jenkins who was held without a sack against Scherff. Same with Eagles defensive end Vinny Curry in Week 4. That’s elite company with 12 Pro Bowl seasons and three Super Bowl rings in the mix. This from the same outlet that named the Redskins the second-worst offensive line in the NFL. While the media spotlight has largely moved off of Scherff, his performance is not lost on Cousins, who has been sacked only five times in 158 passing attempts (3 percent) this season. Only Eli Manning, Derek Carr, Andy Dalton and Ryan Fitzpatrick have been sacked fewer times through four games. “It just makes my life, the play caller’s life, everybody’s life so much easier,” Cousins said of his line earlier this season. “The key is going to be continuing to do it week in and week out going forward. CHARLOTTE, N.C. -- ESPN analyst and Pro Football Hall of Fame wide receiver Cris Carter predicted the Carolina Panthers wouldn’t win more than seven games after Kelvin Benjamin suffered a season-ending knee injury in training camp. The reason was quarterback Cam Newton wouldn’t have enough weapons without his star wide receiver and a true No. 1 to replace him among a cast of no-names. So far, Newton and company are proving everyone wrong. This unknown group of receivers and Pro Bowl tight end Greg Olsen have accounted for seven receiving touchdowns through four games. At this point last season with Benjamin the Panthers had six. Ted Ginn Jr., like Carter a former Ohio State star, has been a big reason. He has 12 catches for 206 yards and three touchdowns, including his first career two-touchdown game in Sunday’s 37-23 victory over Tampa Bay. “I can’t believe Cris Carter," Ginn said when told of the preseason prediction. “He’s a Buckeye. ... It just puts fire in us." Responded Carter by email: “They're having a great year. I admit I made a mistake. Tell him I'll start giving them some publicity." If the Panthers keep winning, the publicity will come. 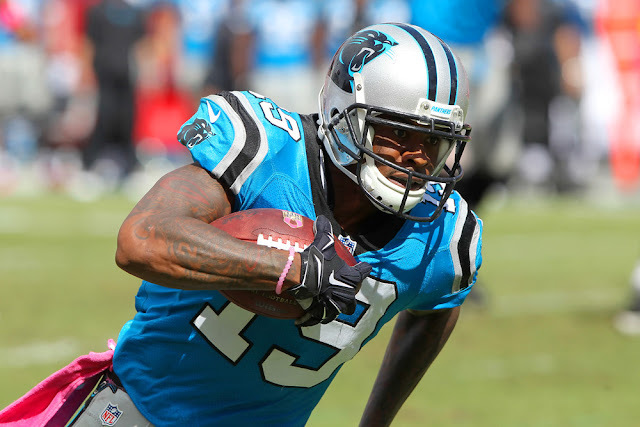 It already is for Ginn, who for some reason excels with the Panthers. He has eight touchdown catches for Carolina in 16 games in 2013 and four this season. In his previous seven seasons for Miami, San Francisco and Arizona he has a combined six touchdown catches. His only touchdown catches the past five seasons have been with the Panthers. “I just feel this team here, this coaching staff, knows what I can do," Ginn said. “They optimize my speed, my talent." 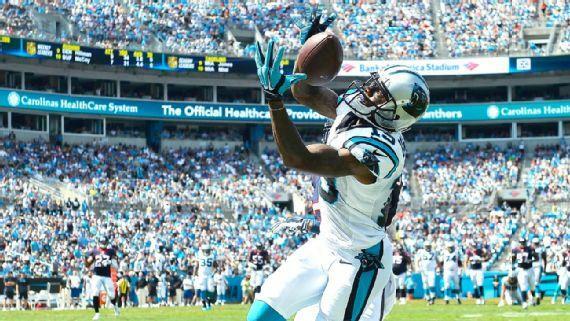 Ginn has been known as a deep threat most of his career, including Carolina. But against Tampa Bay he showed his versatility, catching two passes underneath for touchdowns of 24 and 6 yards. “A lot of people just see the speed," Ginn said. “As long as I keep going out and just putting that out there, our days coming up will be better." Not that Ginn has completely replaced Benjamin. A year ago, the rookie out of Florida State had 21 catches for 329 yards and three touchdowns in his first four games. He finished the regular season with nine. But holding true to what offensive coordinator Mike Shula said when Benjamin was injured, the Panthers have replaced him by committee. Ginn, Philly Brown, Brenton Bersin and Jerricho Cotchery have combined for 38 catches for 398 yards and five touchdowns. Olsen also has played a big role, catching 17 passes for 243 yards and two touchdowns. Give Newton credit, too. There were times last season when he may have depended too heavily on the 6-foot-5 Benjamin. He’s become more confident spreading the ball around. “Cam was forced to use other targets, use other people on offense," cornerback Charles Tillman said Tuesday on ESPN’s "First Take." “He’s dishing out the ball equally. That’s one of the things that’s helped change his game. “I’m loving what I’m seeing on offense." The offense hasn’t always looked pretty, as Ginn reminds. He also reminds it will get prettier when players such as rookie receiver Devin Funchess get more acclimated. Funchess was the player most mentioned when Benjamin was injured. He has only three catches for 38 yards. Others have picked up the slack. Bersin, who moved up from the practice squad after veteran Jerricho Cotchery suffered a high ankle sprain two weeks ago, had a team-high four catches for 54 yards against Tampa Bay. Two were in traffic with the outcome still in doubt. “We expect those from those guys, especially from a group that’s getting so scrutinized with not being good enough," Newton said. “Those guys are really stepping up to the challenge and getting better each week." And so far, proving experts such as Carter wrong.